Superman and Martian Manhunter are overseeing construction of a base on the moon when Superman gets a distress signal and has to leave. Later, Manhunter returns "home" to Metropolis and his life as John Jones, detective with the Metropolis Police. He encounters a neighbor and her son, helps her carry her groceries and gives the boy a bit of a lesson in duty and obligation. Then, alone again in his own apartment and reminiscing about his lost Martian family, Manhunter is overcome with some kind of mental/emotional aggravation and uncontrollably morphs into his true Martian form as he writhes on the floor in apparent agony. Over in Gotham City, Batman and Nightwing are busy busting up a gang called The Mutants when Nightwing encounters a large alien creature in the middle of strangling a homeless man. She intervenes and is dealt a savage blow before Batman arrives and startles the creature into fleeing. Batman returns with Nightwing to the Batcave, sedates and stabilizes her, and proceeds to try and decipher a message the alien left behind. Just as he concludes that he can't decipher the message because the language is not of this Earth, John Jones arrives and declares that the language is in fact Martian. Story - 3: There are a few things about this "parallel" story idea that make me uneasy. Ok, first is this idea that Smallville is a "machine" that "everyone" wants to keep "rolling" - which is how Miller put it in this interview with TV Guide. To the surprise of nobody around here, I don't count myself among the everyone, and in this case it's precisely because the remark - as casual or rhetorical as it might be (or however else we might want to characterize it so as not to feel wholly manipulated) - simply underscores one of the main criticisms I've levied against the property. I'll even quote myself from my review of issue 10: "I continue to find the Superman in Smallville to be less a symbol of truth and justice (and, yeah, the 'American Way,' but I'd say that's been updated and rebooted a time or two itself, plus I'm Canadian) and more a symbol of a symbol (because nor is Smallville canon) of Superman. The stories aren't about truth and justice, they're set inside Superman the symbol, the trademark, the brand. We are meant to feel truth and justice through association with the brand, not through the characterization and dramatization of truth and justice here and now." In this whatever year of our industrialization, I'm sure my feelings on this matter put me squarely in the minority, but seeing the writer comment on his own story as a "machine" really just cements the impression in my mind. Second is that they are going to be situated within the basic continuity of issue numeration (as opposed to being an offshoot of their own, like, say, the Chloe Chronicles) but clearly aren't going to involve Superman all that much. In and of itself, that's no big deal (and is certainly not without precedent in comicdom), but we're the Superman Homepage here, not the DC Comics Homepage. Granted, I can fully appreciate Miller wanting to "fill in the rest of [his] world," but Superman better make more than token appearances is all I'm saying. Remember how you felt when Green Arrow seemed to rule the screen for weeks on end back in seasons 7-9? Yeah, let's avoid that this time, ok guys? In sum, my fear is that Smallville, with the introduction of this every-fourth-week alternate story stuff, is about to jump the shark again. "Effigy" begins "five minutes before the events in 'Haunted'" - which is presumably how much time is supposed to elapse before Supes gets his alert and flies off (to deal with Psimon, obviously) and not the amount of story-world time the events in "Haunted" will go on to consume (specifying "the events" making it sound like those events are/were over and done with in a... what? A flash?! How impulsive! LOL!). Will that be the pattern? Superman in the first scene of each new parallel arc, then not at all for the next three parallel installments, then back again to kick off the next one, then gone again? That will get old fast. Or maybe Miller will surprise me and be more inventive, carefully weaving pieces of each story together so that they feel like one grand narrative. The truth is, in principle I would really dig that. Thus this little rant is mostly just me clearing the air in terms of what I'll be looking for them not to do. That they are giving these stories their own titles and whatnot, however, tells me that there isn't going to be much weaving going on at all. Who remembers 45-rpm records? Yeah, these parallel stories will seemingly serve much the same function as "B-sides." In terms of this first issue, in any case, it was ok. It establishes a context, sets up a distinct conflict, and puts the two Smallville supporting characters together for their team-up wherein they will go and presumably resolve that conflict (taking Nightwing out of the picture, note, interestingly). I even thought the dreaded name labels in the case of Manhunter were used well (distinguishing between his two identities - meaning, they serve an actual dramatic purpose! 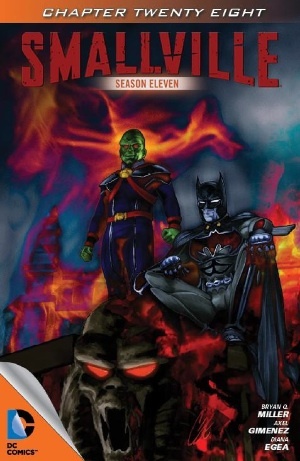 ), though I think it would have been even more effective if the first had used "J'onn J'onzz" rather than "John Jones," especially since they go on to use the "J'onzz" in that moment when he loses his mind in his apartment (he's picking up a telepathic message from the creature we meet later, I expect). In the end, however, it's setting up something that strikes me as none-too-interesting a Smallville outing. Know why? Art - 5: The art was really strong, though - even if I couldn't find any images of real world shoulder holsters that sacrificed their intended secrecy by having the straps cross over in front for all the neighbors and their children to see. Cover Art -2: Pretty crap, actually. Manhunter in particular looks like he was completed in crayon, and Batman isn't much better. All told, this is a significant fall off in the quality I've come to expect from Cat Staggs. Maybe this effort at keeping the "Smallville machine rolling" wasn't such a great idea, after all.